The thing about friendship is, if it’s real it is capable of withstanding the test of time. 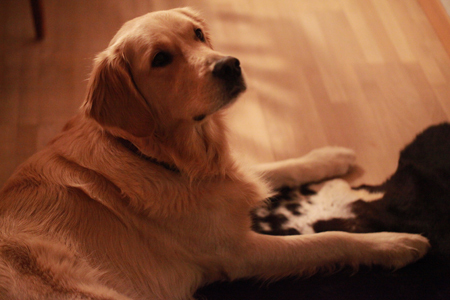 We had a visit at the weekend, friends who have a very special dog – Eole. When you look into Eole’s eyes you know you don’t have to say anything, complete understanding and trust. And when you come back into the room after being away for only a few minutes, he wags his tail so hard that it makes a pounding sound when it hits against the floor. Then he gets up and brings you the closest soft toy and you have to smile and pat him all over! 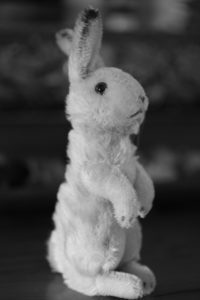 ‘THERE was once a velveteen rabbit, and in the beginning he was really splendid. He was fat and bunchy, as a rabbit should be; his coat was spotted brown and white, he had real thread whiskers, and his ears were lined with pink sateen. On Christmas morning, when he sat wedged in the top of the Boy’s stocking, with a sprig of holly between his paws, the effect was charming. There were other things in the stocking, nuts and oranges and a toy engine, and chocolate almonds and a clockwork mouse, but the Rabbit was quite the best of all. For at least two hours the Boy loved him, and then Aunts and Uncles came to dinner, and there was a great rustling of tissue paper and unwrapping of parcels, and in the excitement of looking at all the new presents the Velveteen Rabbit was forgotten. For a long time he lived in the toy cupboard or on the nursery floor, and no one thought very much about him. He was naturally shy, and being only made of velveteen, some of the more expensive toys quite snubbed him. The mechanical toys were very superior, and looked down upon everyone else; they were full of modern ideas, and pretended they were real. The model boat, which had lived through two seasons and lost most of his paint, caught the tone from them and never missed an opportunity of referring to his rigging in technical terms. 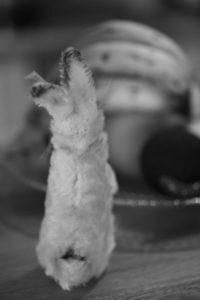 The Rabbit could not claim to be a model of anything, for he didn’t know that real rabbits existed; he thought they were all stuffed with sawdust like himself, and he understood that sawdust was quite out-of-date and should never be mentioned in modern circles. Even Timothy, the jointed wooden lion, who was made by the disabled soldiers, and should have had broader views, put on airs and pretended he was connected with Government. 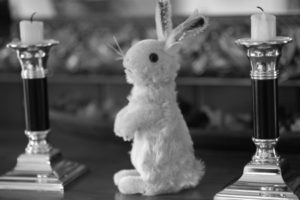 Between them all the poor little Rabbit was made to feel himself very insignificant and commonplace, and the only person who was kind to him at all was the Skin Horse. “The Boy’s uncle made me Real,” he said. “That was a great many years ago; but once you are Real you can’t become unreal again.